Grab and Go Bag designed by Janet Rae Nesbitt for the Summer edition of Primitive Quilts and Projects. This bag is the prefect size to carry your iPad or hand project so they can go along with you to your favorite spot this summer! As seen in the additional pictures, the motif wraps around to the back of the bag, and inside can be found handy slotted pockets for cards, phones, or other necessities! Metallic snap closure. Kit includes fabric, wool and snap enclosure. You provide the flannel batting. Pattern not included. 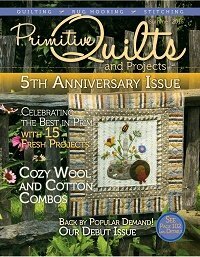 The Primitive Quilts and Projects Magazine 2016 Summer Edition with pattern may be purchased here.